Former Scranton Red Soxx player, Chris Maloney, is now in his second year as first base coach for the St. Louis Cardinals. Maloney's .356 average in 1982 placed him tenth in the ACBL. Jeff Trout, father of Mike, won the batting title with a .481 average. Maloney played collegiate baseball at Mississippi State and was signed as a free agent by the New York Mets in 1983. He played four years in the minor leagues and his last year was with Springfield, the Cardinals A team in the Midwest League. He later managed for 17 years in the Cardinals system posting a 1016-870 record. From 2007 to 2011 he managed the Memphis Redbirds (AAA) and twice guided them to the Pacific Coast League Championship Series. Joe Maddon, another former Scranton Red Soxx player, had a successful season as the field manager of Tampa Bay. The Atlantic Collegiate Collegiate Baseball League will open its 48th season with a full complement of eight teams with the addition of the South Jersey Giants on Monday evening. Greg Manco will be the head coach of the franchise which will play at the Lindenwold Baseball Complex. Manco has fourteen years of college coaching experience with eight years as an assistant coach at St. Joseph's University. Craig Biggio, Rick Cerone, Jamie Moyer, Terry Mulholland and Frank Viola are among the ninety plus former ACBL players who made it to the Major Leagues. Current alumni in the big leagues include Mike Aviles, John Lannan, Ryan Vogelsong, Anthony Varvaro and Zach Lutz. Two Allentown Railers, Joe Forcellini and Adam Davis, were selected for the top ACBL seasonal awards. Forcellini, a rising junior at Centenary (NJ), won the Santy Gallone Most Valuable Player Award while Davis, a rising senior at Delaware earned the Darrin Winston Most Valuable Pitching Award. Forcellini topped the ACBL with 31 RBIs and finished second in slugging with a .507 percentage. The multi-position player finished second in hits (46) and third in doubles (10) and home runs (4). Davis had the most wins with six and finished second in ERA at 1.33. He also tossed a no-hitter during the regular season and posted 37 Ks in 47.1 innings. Rich Ricciardi (Trenton, Alvernia) won the hitting award with a .395 average. Vincenzo Aiello ( Trenton, Rider) put up impressive stats to earn the Relief Pitcher of the Year Award. The rising sophomore notched six saves to go along with his 3-0 record and posted a 0.50 ERA in 17.2 innings. Mike Bradshaw (Staten Island, Howard College) was named to the Slugging Award after putting up a .573 slugging average which included six home runs. The North Jersey Eagles following a familiar script captured their 2nd consecutive ACBL title yesterday at Overpeck Park. The Eagles, for the second time in two years, did it the hard way – having to win 4 consecutive elimination games to take the crown. After dropping Friday’s Tournament Opener to the top seeded Trenton Generals 8-7, North Jersey beat the Staten Island Tide 3-0 behind Jordan Gross’s (Tulane) seven shutout innings and a six out save from Steven Bloodworth (Wagner) on Saturday morning. Saturday night the Eagles looked to Sophomore Gianni Zayas (Seminole State) to keep their Title hopes alive. Zayas threw 6.1 solid innings before turning the game over to RHP Steven Bloodworth for his second save of the day as North Jersey eliminated the Trenton Generals 7-4 to advance to Championship Sunday. North Jersey gave the ball to LHP Brendan Ryan (U Albany) against the Allentown Railers who were undefeated coming into Sunday’s Tournament action. Trailing 2-0 after the 1st inning, the Eagles scored 3 times in the top of the 3rd on big hits from Chris Smith (Wagner) and Ken Kirshner (St Thomas Aquinas) to take a 3-2 lead that they would never relinquish. Brendan Ryan pitched 7.2 gutty innings before Ryan Casey (Wagner) shut the door with a 4 out save. After a 40 game regular season and three days of Playoff baseball – the stage had been set for one final, winner-take-all game for the 2013 ACBL Championship. The game was destined to be a Classic. For the second consecutive game the Railers struck first. Brett Bittiger (Fairleigh Dickinson) lead off the bottom of the 3rd with a walk and scored on a wild throw on a bunt play. Andrew Brandstetter (East Stroudsburg) then scored on a 4-6-3 double play to give the Railers a 2-0 lead. North Jersey’s Zach Passerelle’s (Marist) RBI single in the 4th cut the lead in half. And in the 7th the Eagles pulled even with a Passerelle double to left-center and a RBI single by John Brucker (Rutgers). Both starting pitchers turned in stellar outings – Alentown’s Michael Burke (Lehigh) and North Jersey’s Danny O’Neil (Willaim Paterson) allowed only 3 and 4 hits respectively. Allentown and North Jersey would take the season to its FINAL inning and one of the most exciting finishes in ACBL history. Allentown’s Brandon Shimo (Kutztown) retired the first two batters in the top of the 9th inning before Chris Chiaradio (Seton Hall) stepped to the plate. After battling the count to 3-2, Chiardio blasted his first home run of the season onto the right field knoll giving the Eagles its first lead of the game. The Railers continued the battle in their half of the 9th inning. James Bertolotti (Alvernia) lead off with a bad-hop single to right. After being bunted to second, Bertolotti took 3rd on a wild pitch with one out. Jeff Birkoffer (Moorehead St) then drove a towering fly ball to ceneter field. Eagles CF Chris Smith (Wagner) made the catch and then unleashed a great throw to cut down Bertolotti at the plate to secure the win and the 2013 ACBL Championship. For the second year in a row the North Jersey Eagles made a remarkable playoff comeback to win the 2013 ACBL championship. The Eagles defeated the Allentown Railers 7-5 in the first game as Ken Kirshner posted three RBIs and Jordan Gajdos added two RBIs. Brendan Ryan pitched 7.2 innings for the win while Ryan Casey picked up the save. A solo home run by Chris Chiaradio in the top of the ninth inning provided the margin of victory for the Eagles in the second game. The game ended at 3-2 with Chris Smith throwing out the tying run at the plate in the bottom of the ninth inning. Ryan Quinn added three hits while Zach Passerelle chipped in with two hits. Jonathan Reich picked up the win in relief of Dan O'Neil who only allowed one earned run in 6.1 innings. The Allentown Railers defeated the Trenton Generals 8-2 in the winners bracket game to move on to the championship game at 2pm Sunday. Adam Davis allowed two runs over seven innings to get the victory. Joe Forcellini had three RBIs and two hits for the Railers. Andy Brandstetter, Jeff Birkofer and Jesse Kelso also each posted two hits. Earlier in the day North Jersey defeated Staten Island 3-0 behind seven innings of shutout ball from Jordan Gross. The Eagles defeated Trenton 7-4 in the nightcap to advance to the championship round on Sunday. If the Eagles win the first game, a second game would follow thirty minutes after the first game is finished. The Trenton Generals and Allentown Railers both won games on Friday and advance to the 3pm game on Saturday. The Staten Island Tide and North Jersey Eagles will play at 11am in the losers bracket. The Generals defeated the Eagles 8-7 in a home run filled contest. Matt Patterson hit a grand slam home run in the fifth inning to give Trenton a 7-1 lead. The Eagles came back with three run home runs by Stetson McCollin in the sixth inning and Chris Smith in the ninth inning. Smith also hit a solo home run in the fourth inning. Allentown rode the one hit shutout pitching of Brandon Shimo to a 5-1 win over the Tide. Drew Hercik posted two RBIs while Joe Abeln added two doubles. The ACBL will hold its 2013 Championship Tournament this weekend, August 2nd through the 4th at Overpeck-Ridgefield Park, home of the North Jersey Eagles. The number one seed, Trenton Generals (27-13) finished the season in a tie with the number 2 seed Allentown Railers (27-13), winning the tie breaker for the number one seed. Staten Island (25-14-1) will be the number three seed, followed by North Jersey (21-18-1) as the number four seed. The action kicks off Friday at 2pm as Trenton takes on North Jersey. In game 2, Allentown will play Staten Island beginning at 7pm. All the action for this weekend can be heard live over the internet, as Tom Willms will broadcast the entire tournament for IYM Sports Radio. Coming up this weekend, from August 2nd to the 4th, the Atlantic Collegiate Baseball League will hold their 2013 playoffs at Overpeck County Park in Ridgefield Park, NJ, and IYM Sports Radio will be there! Join play-by-play voice Tom Willms for full coverage of the entire double-elimination, playoff tournament, as the top 4 teams in the league battle for the title of ACBL Champions!! You can hear the games at IYMSportsRadio.com or on your IPad, IPhone and Android device using the UStream app and searching for the IYM Sports Radio channel. It all gets started on Friday, August 2nd at 2pm, so if you can't make it to the games, you can still listen along to all of the exciting action, LIVE, on IYM Sports Radio!! The Jersey Pilots split a doubleheader Sunday as they lost the first game 12-4 but won the second game 2-1 against the Allentown Railers at Snyder Park in Berkeley Heights, NJ. In the first game, the Railers were able to collect 6 runs in the first two innings to bust the game open. Pilots’ starter Charles Theilmann went 3 2/3 innings, giving up 8 hits on 7 runs, walked 7 batters and struck out 4. Joe O’Connor led the Pilots in hits going 3 for 3. Joe Mendez went 2 for 3 with a home run and 2 RBIs. Steve Petriello added a 2-run homer for the Pilots as well. Max Schmardel started the second game for the Pilots. After pitching an inning in the first game of a doubleheader yesterday as well as hitting the game-winning sacrifice fly in the second game, he went the distance in this game, going 7 innings, scattering 8 hits and giving up only 1 run while striking out 6 and totaled 103 pitches. Tyler Martis hit an RBI single up the middle to put the Pilots up 1-0 early. After the Railers tied it, a double steal with runners on 1st and 3rd in the bottom of the 6th was the difference in the game. The next Pilots’ game is July 23rd when the travel to Trenton to play the Generals for a 5 p.m. start at Mercer County Community College. Tonight's ACBL All-Star Game that was scheduled to be played at Memorial Park in Quakertown, PA has been cancelled due to poor field conditions. The rosters for the annual ACBL All-Star game at Quakertown on Monday evening July 22 have been released. The East team will be managed by Jorge Hernandez of the North Jersey Eagles and will have players from the Eagles, Jersey Pilots, Staten Island Tide and Trenton Generals. The West team will be managed by Dylan Dando of the Allentown Railers and will be composed of players from the Railers, Lehigh Valley Catz and Quakertown Blazers. 15 Vincenzo Aiello, Trenton 6'2" 205 R/R Rider So. 25 Matt Alvarez, Staten Island 6'1" 185 R/R Boston College RS Sr.
1 Emilio Calderon, Staten Island 6'2" 198 L/L Kean Jr.
13 JB Kole, Trenton 6'3" 205 R/R Villanova Jr.
17 James Meindl, Jersey 6'4" 220 R/R Siena Sr.
19 John Silvestri, Jersey 6'3" 225 L/L Montclair St. Sr.
34 Stephen Silvestri, Jersey 6'1" 195 R/L Univ. of Penn Jr.
18 Gianni Zayas, North Jersey 6'2" 195 R/R North Carolina St. So. 27 Zach Passarelle, North Jersey 6'3" 225 L/R Marist Sr.
11 Stephen Petriello, Jersey 5'8" 185 R/R Rowan So. 7 Juan Bueno, Staten Island 6'0" 185 R/R Grambling St. Sr.
11 Andrew Lopez, Trenton 5'9" 185 R/R Kean Jr.
1 Tyler Martis, Jersey 5'7" 140 R/R Siena So. 3 Jesus Medina, Staten Island 5'10" 155 R/R Sacred Heart So. 24 Matt Patterson, Trenton 6'4" 225 R/R Alvernia Sr.
33 Rich Ricciardi, Trenton 6'0" 195 S/R Alvernia Jr.
26 Ryan Quinn, North Jersey 5'9" 180 R/R Cincinnati Sr.
20 Mike Bradshaw, Staten Island 6'5" 205 R/R Howard College Jr.
4 Sean Farrell, Trenton 6'2" 180 R/R Marist So. 7 Matt Horican, Jersey 5'9" 175 L/L Kean Sr.
9 Kenneth Kirshner, North Jersey 6'0" 170 L/L St.Thomas Aquinas Sr.
28 Chris Smith, North Jersey 6'1" 195 R/R Wagner Sr.
12 Richard Mejia, Staten Island 6'1" 205 R/R Adelphi Sr.
34 Joe Ravert, Trenton 6'2" 225 L/R LaSalle So. 4 Anthony Ciavarella, Lehigh Valley 6'0" 170 L/L Monmouth So. 32 Casey Cooperman, Allentown 5'11" 195 R/R Bloomsburg Sr.
11 Jeff Courter, Quakertown 6'3" 205 L/L Villanova RS So. 20 Adam Davis, Allentown 6'0" 175 R/R Delaware Sr.
36 Ryan Filipowicz, Quakertown 6'3" 190 R/R Holy Cross Jr.
18 Xavier Hammond, Allentown 6'3" 205 L/L Bucknell Jr.
8 Heath Fillmyer, Trenton 6'1" 165 R/R Mercer County So. 9 Mike Weinhold, Quakertown 6'1" 185 L/L Alvernia Sr.
52 Brandon Shimo, Allentown 6'1" 180 R/R Kutztown Sr.
27 Austin Orth, Lehigh Valley 6'2" 235 R/R Yavapai So. 17 Alex Kowalczyk, Quakertown 6'2" 205 R/R Old Dominion So. 10 Tyler Brong, Quakertown 6'2" 220 R/R Lehigh Sr.
16 Jeff Birkofer, Allentown 6'2" 165 R/R Morehead St. Sr.
18 Mike Constantini, Quakertown 6'1" 180 R/R West Virginia Sr.
10 Drew Hercik, Allentown 6'3" 185 R/R East Stroudsburg Jr.
11 P.J. Higgins, Lehigh Valley 5'11" 165 R/R Old Dominion So. 7 Mike Rampone, Lehigh Valley 5'10" 185 R/R NJIT Jr.
9 Joe Bamford, Lehigh Valley 6'3" 183 Monmouth Sr.
19 Corey Jensen, Lehigh Valley 5'10" 180 Whittier Sr.
40 Jesse Kelso, Allentown 5'11" 185 Canisius Sr.
12 Brandon Martinez, Quakertown 5'11" 175 Kutztown Jr.
21 Jeremy Musser, Quakertown 6'0" 185 Millersville So. 12 Joe Forcellini, Allentown 6'2" 195 R/R Centenary Jr. The Jersey Pilots dropped a game last night to the Staten Island Tide by a score of 14-2 at Snyder Park in Berkeley Heights, NJ. After the Pilots got out to a 1-0 lead, it was all Tide after that as they scored 6 runs in the top of the 2nd to break the game open. Pilots’ starter John Silvestri went 2 innings plus, giving up 8 runs (5 earned) on 8 hits while striking out 3. Richard Mejia, Tyler Clark, and Shawn Heide each powered the Tide offense with a home run in the game. The Pilots managed nine hits of their own. Aaron Vogt went 3 for 5 with an RBI. Joe Mendez collected 2 hits as well. Greg Fazio added a solo shot for the other run for the Pilots on the night. The Pilots used 5 pitchers in the game. Max Schmardel and Jimmy Meindl had great games, combining for 3 innings, giving up 3 hits and one run while striking out 6. The Pilots’ next game is Saturday July 20th when they travel to Mercer County Community College to take on the Trenton Generals for a doubleheader starting at 1 p.m. The Jersey Pilots lost a tough game yesterday to the first place Trenton Generals by a score of 8-5 at Snyder Park in Berkeley Heights, NJ. Both teams had their fair share of hits and runs as the teams combined for 13 runs and 24 hits. Pilots’ starter Charles Theilmann went 6 innings, giving up 6 runs on 8 hits while striking out 3. Matt Horican, Brandon Gonnella, and Greg Fazio each collected 2 hits and an RBI. The Generals were able to use the long ball as they hit 2 homeruns in the game to break the game open late. The Pilots’ next game is Tuesday July 16th when they travel to Allentown to take on the Railers for a doubleheader starting at 5 p.m. The Jersey Pilots won their second straight game against the Lehigh Valley Catz by a score of 5-4 yesterday at Snyder Park in Berkeley Heights, NJ. After the Catz struck first in the opening inning, Tyler Martis tied the game with a sacrifice fly to tie the game at 1. In the bottom of the 2nd, Phil McGovern drove in John Jennings on an error to put the Pilots in the lead. Matt Horican drew a walk and Joe O’Connor scored on a wild pitch to make it 3-1. The next inning, it was Joe O’Connor again as he singled to drive in Aaron Vogt to make it 4-1 Pilots. Phil McGovern was at bat and Catz starter Ryan Lubreski threw a wild pitch to score John Jennings to pad the lead to 5-1. Pilots’ starter John Silvestri had a good outing, going 7 innings while scattering 3 hits allowing one unearned run and struck out 4. After the Catz got to within 1 in the top of the 8th, reliever Jed Lemen was able to pitch out of a jam with a runner on third and nobody out to seal the game. The Jersey Pilots dropped the first game 2-1 but won the second game 4-3 in a doubleheader yesterday against the Staten Island Tide yesterday at Snyder Park in Berkeley Heights, NJ. In the first game, Pilots’ starter Steve Silvestri had another good outing, going 6 innings allowing 2 runs (1 earned) on 4 hits while striking out 3. The only two runs he gave up were solo home runs to Michael Bradshaw and George Kantzian. The Pilots managed a run in the bottom of the 7th as Joe O’Connor picked up an RBI on a double play, but then with 2 outs and a runner on third, Phil McGovern grounded out to end the game. In the second game, Pilots’ starter Mark Palumbo pitched 5 innings, allowing 8 hits while striking out 3. The Pilots’ bats got going. It was Joe O’Connor again as he smacked a double to left that rolled to the wall. Joe Mendez hustled and scored all the way from first to get the Pilots on the board and trailed 3-1. In the bottom of the 4th, Joe Mendez crushed a 3-run homer over the center field wall to give the Pilots a 4-3 lead for good. Billy Worswick closed the door, earning his first save of the season going 2 innings of hitless ball while striking out a pair. The Pilots’ next game is Thursday July 11th when they host the Lehigh Valley Catz for a 7 p.m. start at Snyder Park in Berkeley Heights, NJ. Adam Davis (Delaware) no-hit the Lehigh Valley Catz as the Allentown Railers defeated the Catz 7-0 in the first game of an ACBL doubleheader in Easton. The rising Blue Hen senior struck out eight and walked two as he threw 92 pitches in the seven inning affair. On the season he is now 3-1 with a 1.20 ERA in 30 innings. Matt Bahnick (Tallahassee CC) sparked the offense as the Railers also won the second game 7-4. Bahnick went five-for-eight on the day with two doubles and a home run while netting six RBIs. The Jersey Pilots came up with a big win as they defeated the Allentown Railers 6-1 on a Fourth of July afternoon game at Snyder Park in Berkeley Heights, NJ. Starter John Silvestri had a nice bounce back outing as he went 6 innings, scattering 7 hits while striking out 3. Silvestri brought his strikeout total to 27, which is good for 5th overall in the league. The Pilots’ bats woke up as they managed a season-high 12 hits. Matt Horican went 3 for 5, while Tyler Martis and Phil McGovern each collected 2 hits. Steve Petriello stayed hot for the Pilots as he added a hit to bring his BA to .316, which is top 10 in the league. Aaron Vogt broke the game wide open with a 3-run inside-the-park home run. Joseph Mendez added a solo shot in the bottom of the 6th. Billy Worswick and Jimmy Meindl combined for 3 innings of 2-hit ball while striking out 3 to close out the game. The next Pilots game is Sunday July 7th when they host the Generals at Snyder Park at 7 p.m.
St. John's University in Jamaica, Queens, was the site of the first ever All-Star Game between the Atlantic Collegiate Baseball League (ACBL) and the U.S.A. Military baseball team. The military team has played all over the country as part of the "Red, White and Blue Tour." The ACBL earned a close 5-4 victory in the game. John Lannan (Siena, Long Island Collegians) allowed only one earned run over seven innings as the Phillies defeated the Dodgers 16-1 on Friday night. Lannan collected his first RBI of the season as he went three-for-four. Joe Martinez (Boston College, Jersey Pilots) earned a victory in his first major league appearance of the season as he hurled two scoreless innings of relief in the Indians 4-3 win over the White Sox. Martinez was called up from Triple-A Columbus on Saturday. The ACBL All-Stars topped the U.S. Military All-Stars 5-4 on Saturday evening at Jack Kaiser stadium on the campus of St. John's University. Matt Patterson (Alvernia), Rich Ricciardi (Alvernia), Joe Bamford (Monmouth) and Narciso Crook (Gloucester) all contributed RBIs. Keenan Stare (East Stroudsburg) received the win and Gianni Zayas ( NC State) recorded the save with a scoreless ninth inning. Jack Kaiser Stadium will host an exhibition game between a team of all-stars from the Atlantic Collegiate Baseball League (ACBL) and the U.S. Military. The game, which is part of the "Red, White and Blue Tour" for the U.S. Military All-Stars, will take place at 6:35 p.m. on Saturday, June 29 and will be produced on-campus for a live broadcast on ESPN3. Ralph Bednarczyk will be on the call with former NYIT head coach Bob Hirschfield serving as color analyst. The ACBL has released the roster for the All-Star team which will host the U.S. Military All-Stars on Saturday June 29 at Jack Kaiser Stadium on the campus of St. John's University. Pregame ceremonies begin at 6:10pm with the opening pitch at 6:35 pm. This will be the final game on the New England/ New York tour and the U.S. Military All-Stars leave Sunday for the Midwest portion of their nationwide travels. 19 John Silvestri (JP) 6'3" 225 L/L Montclair St.
18 Gianni Zayas (NJ) 6'2" 195 R/R North Carolina St.
7 Juan Bueno (SI) 6'0" 185 R/R Grambling St. The Jersey Pilots picked up a win last night against the first place Trenton Generals by a score of 2-1 at Snyder Park in Berkeley Heights, NJ. The Pilots' starting pitcher Ari Kaufman pitched a great game, going 4 innings while giving up a run while striking out a pair. The Pilots' bullpen kept Trenton scoreless after that. The combination of Brett Hancock, Steve Silvestri, and Max Schmardel went 4 innings while scattering 3 hits and striking out 4 batters. Jimmy Meindl entered in the ninth and picked up his second save of the season. The Pilots' bats produced 5 hits. Steve Petriello went 2 for 4 with an RBI and a run. The next game for the Pilots is Friday June 28th when they travel to Staten Island to take on the Tide at 5 p.m. The Jersey Pilots dropped both games of the doubleheader yesterday against the North Jersey Eagles 6-0 and 2-1 at Snyder Park in Berkeley Heights, NJ. In the first game, the Pilots could not do much at the plate. Matt Horican, Greg Fazio, and Joe Mendez collected the only hits for the Pilots. The Pilots made 3 errors in the top of the 4th, starter Connor Smith gave up 5 hits and the Eagles scored 4 runs in the inning that broke the game open. In the second game, Pilots starter Tommy Giunta made his first start of the year and pitched well, going 3 innings and only giving up 2 runs coming off a two-run homerun by Chris Smith. The Pilots bullpen held the Eagles offense in check after that. The Pilots finally broke through for a run as Phil McGovern hit a double to score Joe O'Connor to cut the lead to 2-1. That was all the Pilots could do on offense as the Pilots fell to 2-11 on the season. The Pilots battle the Eagles again at Overpeck Park for a 7 p.m. start on Tuesday June 25th. Stuart Turner (Southampton, Mississippi) was drafted in the third round of the 2013 First Year Player MLB Draft by the Minnesota Twins and heads the list of 33 former or current ACBL players who were drafted. Turner, a junior catcher who transferred to Ole Miss from LSU-Eunice was selected with the 78th pick overall. Outfielder Jordan Patterson (Westhampton, South Alabama) followed closely as a Colorado Rockie draft in the fourth round. Pitchers Aaron Slegers (Riverhead, Indiana) and Kyle McGowin (Sag Harbor, Savannah St.) were drafted in the fifth round by the Twins and Angels respectively. The Quakertown Blazer pitching duo of RHP Lou Trivino (Slippery Rock) and LHP Tim Mayza (Millersville) went in the 11th and 12th rounds respectively. Trivino was selected by the Oakland Athletics while the Toronto Blue Jays selected Mayza. A complete list of the 33 players drafted is listed below. 5 157 Angels Kyle McGowin RHP Sag Harbor Savannah St.
27 819 Orioles Donnie Hart LHP Westhampton Texas St. The Jersey Pilots were unable to get the bats going as they lost to the Blazers 6-0 last night at Snyder Park in Berkeley Heights, NJ. Starter Mark Palumbo had a decent outing, going 4 innings allowing 3 runs while striking out 1. The Blazers’ starter, Mike Wienhold, proved to be the difference in the game. He held the Pilots’ offense to 7 shutout innings, scattering 6 hits while striking out 7. Wienhold had a perfect game going until he walked Joe O’Connor in the 4th and then the next batter, Stephen Petriello, broke up the no-hitter with a single. The Pilots had their chances against Wienhold, but left 6 men on base, as they could not break through. For the Blazers, Alex Kowalczyk went 3 for 5 with an RBI. The Pilots’ two best hitters were Matt Horican and Tyler Martis, who both doubled, accounting for the Pilots’ only extra base hits. The Pilots’ next game is Sunday June 23rd when they host the first place North Jersey Eagles in a doubleheader starting at 5 p.m. at Snyder Park. Adelphi standout Richard Mejia hit a walk-off homerun in the bottom of the 11th inning for the Staten Island Tide in their 1-0 win over the Lehigh Valley Catz on Tuesday at Susan Wagner High School. The Tide’s Andrew Zapata and the Catz’ Anthony Ciavarello were locked in a pitcher’s duel for the entire game. Zapata went 9 innings giving up only four hits with zero earned runs, zero walks and eight strikeouts. Ciavorello matched him going 8 shutout innings while scattering 5 hits. The Tide threatened in the bottom of the 8th after a leadoff walk followed by a single, with the top of their order coming up. But Ciavarello was able to escape the jam, getting the next three batters. Juan Bueno went 3-4 with two doubles for the Tide, improving his season average to .409. Jesus Medina also added a double. Matthew Festa got the win after throwing two shutout innings allowing only one hit in relief of Zapata. The Tide's next game is Saturday, June 15th in a doubleheader against the Trenton Generals at Mercer County College. The Jersey Pilots earned their first two wins of the season yesterday by beating the Lehigh Valley Cats in a doubleheader on Snyder Avenue in Berkeley Heights, NJ. They won the first game, 2-1 and then the next game, 3-2. In the first game, John Silvestri was on the mound for the Pilots and had his best start of the season to date. Silvestri tossed 6 innings, allowing only 1 run while scattering 3 hits and striking out a season high 9 batters. Silvestri is now leading the league in strikeouts with 15. The Pilots bats got going early. In the bottom of the 3rd, the leadoff man John Roszell took a first pitch fastball and crushed it over the left field wall for his first home run of the season as well as the first for the Pilots as a team. This lead would only hold until the top of the 6th. The Catz finally broke through on Silvestri. After a leadoff hit by Case and when he advanced to third, Mike Rampone drove him accounting for the only run that Silvestri was to give up. The Pilots came right back in the bottom of the 6th. John Jennings led off the inning with a single. After Greg Fazio sacrificed him over to second, two batters later Matt Horican drove in the go-ahead run with a single to center as Jennings came around to score to give the Pilots a 2-1 lead. That would be all that Jimmy Meindl needed as he came in to close the door on the Catz in the top of the 7th to earn his first save and give the Pilots their first win of the season. In the second game, the Pilots got off to a good start with the bats again. In the bottom of the 3rd, Tyler Martis started off the inning with a single. After he advanced to second, it was Matt Horican again who comes up with a big hit as he singled it Martis to give the Pilots a 1-0 lead. Horican then stole second. Beau Horan was up to bat and he singled in Horican easily to give the Pilots a 2-0 lead. The Catz would come back in the next half inning. After Bamford walked and Orth was hit by a pitch, PJ Higgins was able to break through on the starter Mark Palumbo to score Bamford to cut the Pilots lead to 2-1. After Orth and Higgins advanced on a wild pitch by Palumbo, Jenkins drove in a run on a walk tying the game 2-2. Tommy Giunta had a strong outing, going 2 scoreless innings while striking out 2. The win in this game would go to Charles Theilmann, who pitched a scoreless top of the 7th, allowing one hit and striking out one. In the bottom of the 7th, the Pilots would come through again with the bats. Phil McGovern would lead off the inning with a single. Two batters later, Jennings walked to make it runners on 1st and 2nd with 1 out. Three batters later, Matt Horican came up with 2 outs and the bases loaded. He comes through again as he drew a walk to score the game winning run as the Pilots win 3-2. Horican now leads the Pilots in batting average and is 3rd overall in the league with a .400 BA. The Pilots next game is Tuesday when they travel to the North Jersey Eagles for a 7 p.m. start at Overpeck Park. Pitchers Lou Trivino (Slippery Rock) and Tim Mayza (Millersville) and Jerry Mulderig (Rider) were among the 33 former or current ACBL players drafted in the recent 2013 First Year MLB Draft. Trivino, a graduate of Upper Bucks Christian High School, set SRU single season (92) and career (227) strikeout records. He was drafted in the 11th round by the Oakland Athletics. Mayza, a graduate of Upper Perkiomen High School, posted a PSAC-best 1.55 ERA and was selected to the Daktronics All-America Third Team. He was drafted by the Toronto Blue Jays in the 12th round. Mulderig, a graduate of Council Rock South, was an All Metro Atlantic Athletic Conference selection as DH, but was drafted as a pitcher in the 28th round by the Pittsburgh Pirates. He posted a 3-2 record on the mound with opponents hitting .229 against him. Four former Staten Island Tide players were drafted in this year’s MLB Draft. Zack Granite, Jason Kanzler, Dillon McNamara and Kevin Herget were all drafted on Day 2 of the draft on Saturday. 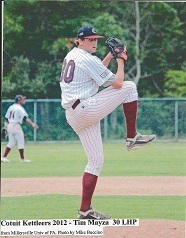 Granite, 2011 ACBL Champion with the Tide, was drafted by the Minnesota Twins in the 14th round. Granite’s 2011 teammate, Jason Kanzler was also drafted by the Twins but in the 20th round. McNamara, a member of the Tide’s 2010 team, was drafted in the 27th round by the New York Yankees. Herget who pitched for the Tide in 2010 and 2011, including a win in the 2011 championship game, was drafted in the 39th round by the St. Louis Cardinals. As starting centerfielder for the Seton Hall Pirates, Granite had a great year as the leadoff hitter batting .316 with a team-high 30 walks. He was named All-Big East Baseball First team in May. In 2011, Granite was a great catalyst for the Tide. He batted .289 with 26 runs, 35 hits and 10 stolen bases. Granite led the team in doubles (9) and walks (14). Kanzler led the Buffalo Bulls to a 19-7 MAC record while batting .322 with 10 home runs, 46 RBI's and 20 steals. Jason Kanzler, now senior outfielder for the Bulls, was named 2013 Mid-American Conference (MAC) Player of the Year in May. In his 2011 season with the Tide, he led the organization to their first ever ACBL title. In 34 games he hit .333 with 43 hits, 5 home runs and 24 RBIs, each good for the team lead. Dillon McNamara, Adelphi’s star relief pitcher, set the program’s single season saves record with 13. The 6-foot-5 closer earned three All-America team honors this spring, finishing with a 0.28 ERA, going 30 innings before allowing an earned run. Kevin Herget had an outstanding season for the Kean Cougars going 9-2 with a 1.57 ERA in 103 innings pitched. The senior pitcher was named All-American Second-Team by D3Baseball.com last week. Herget also had a stellar career for the Tide in the 2011 and 2010 seasons. In 2011 he went 4-2 with a 4.05 ERA and 29 strikeouts in 8 starts. Even better in 2010, he went 4-2 with a 2.42 ERA with 35 strikeouts in 7 starts. The Trenton Generals have announced that 2 of their players, Narcisco Crook and Heath Fillmyer were selected in the MLB First-Year Player Draft yesterday. Narciso Crook was selected in the 23rd Round by the Cincinnati Reds. Crook an outfielder attended Gloucester County College (NJ). His team won the NJCAA Division III National Championship and he was voted MVP. Heath Fillmyer who pitched collegiately at Mercer County Community College, was selected in the 28th round by the Colorado Rockies. Staten Island, N.Y. -Tide leadoff hitter and second baseman Jesus Medina went 2-3 with two walks and three runs scored but the Staten Island Tide suffered a 7-5 loss to the Trenton Generals in their home opener Tuesday at Susan Wagner High School. The Tide fall to 0-3 on the early season and the Generals move to 2-0. The Tide got off to a strong start with good pitching from Andrew Zapata. Zapata had nine strikeouts in 4 1/3 innings while only walking one. He finished with four earned runs. Medina scored in each of his first two at bats on two RBI singles from Juan Bueno , giving the Tide an early 2-1 lead. The turning point of the game was when Zapata got a tough break on a ground rule double that was called fair in the 5th inning. The Generals went on to score five runs in the inning and take the lead. The Generals got a big game from leftfielder Narcisco Crook who went 2-4 with a double, a single, a walk and one run scored. Mike Doran of the Tide contributed a big middle relief appearance to keep the Tide in striking distance. He finished with 2 2/3 innings and three strikeouts while only allowing one hit and one run. Tyler Clark and John Fussel also added RBI singles for the Tide. The Tide’s next time out is Thursday at 5 p.m. at the Trenton Generals, Mercer County Park. Berkeley Heights, NJ- Joe Ravert (LaSalle/Havertown,PA) hit a 2-run opposite field home run in the top of the 1st and the Trenton Generals(1-0) didn’t look back as they won their ACBL season-opener by a score of 9-1 over the Jersey Pilots(0-3). Although the Pilots, scored once in the bottom of the frame, on a Stephen Petrillo (Rowan/South Plainfield, NJ) RBI Sac-Fly, Jersey could not muster any more offense against a General pitching staff that combined for 17 strikeouts in the 8-inning, weather-shortened contest. In addition to the 2-run start in the first, the Generals were powered by a 5-run fifth inning, featuring a bases clearing double by Matt Patterson (Alvernia/Hamilton, NJ) and RBI singles by Treavor Dubiel (David & Elkins/Washington, NJ) and Rich Ricciardi (Alvernia/Manalapan, NJ). Two more runs were added in the eighth by Trenton, thanks to a 2-run pinch-hit single by Sean Farrell (Marist/Yardley, PA). Mark Maksimow (George Mason/Hamilton, NJ) led the way on the mound for the Generals, getting the last 6 outs, all via the strikeout. Both teams get back at it on Tuesday, with the Pilots heading to Ridgefield Park to take on the North Jersey Eagles while Trenton goes to Staten Island to battle with the Tide to start a home-and-home series. IYM Sports Radio is proud to announce, that for the 2nd straight season, they will be the online radio home of the Trenton Generals of the Atlantic Collegiate Baseball League. In their inaugural season, the Generals won a regular season division title. This year, they aim to capture the ACBL Championship. IYM Sports Radio will carry all 40 games, home and away, on their website, IYMSportsRadio.com. Broadcast are also available on IPads, IPhones and Android devices utilizing the UStream app and searching for IYM Sports Radio. That means you can hear the Trenton Generals at home and on the go. The season gets underway on Sunday, June 2nd, on the road, as they take on the Jersey Pilots. The ACBL will kick off its 47th season with a pair of doubleheaders on Saturday June 1,2013. The 2012 champion North Jersey Eagles host the Staten Island Tide in a twinbill starting at 1pm in Overpeck Park. The Jersey Pilots travel to Easton to play the Lehigh Valley Catz in a 1pm doubleheader. On Sunday the Quakertown Blazers celebrate their 30th season of ACBL baseball as they host the Allentown Railers in a 1pm doubleheader at Memorial Park. At 7pm the Jersey Pilots welcome the Trenton Generals to Snyder Park in Berkeley Heights, New Jersey. An All-Star team from the Atlantic Collegiate Baseball League will host the U.S. Military All-Stars on Saturday June 29 at 6:35pm at Jack Kaiser Stadium on the campus of St. John's University. The U.S. Military All-Stars are the largest, fastest growing, most successful and only joint armed forces baseball program in the world. The historic "Red, White and Blue Tour of America" has visited over 40 states and six countries and has become the world's most popular summer exhibition. The tour has been enjoyed by over 25 million people over the past twenty-four years. This will be a great opportunity to honor those who have served for our country. General admission tickets are $10.00. There are special $5 tickets for seniors, students, children and groups of 20 or more. Former ACBL All-Star Anthony Varvaro ( Metro NY Cadets) pitched two scoreless innings on Thursday and received the victory as the red hot Atlanta Braves defeated the Pirates 6-4. The former St. John's University standout has not allowed an earned run in five appearances covering 8.1 innings. He has a 0.72 WHIP and opponents are hitting .172 against him. Tim Mayza (Blazers, 2011) has been added to the Tino Martinez Award Watch List. The award is presented annually to the outstanding player in NCAA Division II Baseball. Mayza joins former Blazers Lou Trivino (Blazers,2011) and Robbie Zinsmeister (Blazers,2010) on the watch list. Mayza has an 8-1 record for Millersville and has posted a 1.26 ERA in 64.1 innings. The 6-3 LHP has a WHIP of 0.92 and opponents are hitting .196 against him. Mayza has struck out 59 with 15 walks. Trivino has a 5-3 record with a 2.14 ERA in 54.2 innings with Slippery Rock. The 6-5 RHP has struck out 61 with 14 walks and opponents are hitting .191 against him. Zinsmeister is hitting .398 with 16 stolen bases in 17 attempts. He plays SS, 2B and CF for Indiana University of PA and tops the PSAC in runs (40), doubles (14), triples (7),total bases (91) and slugging percentage (.711). Chris Reed (Stanford University, Torrington Titans), the number one prospect in the ACBL for 2010, tossed a no-hitter for 3 innings against a split squad Los Angeles Dodgers team on Thursday night in Rancho Cucamonga, California. The 6-4 LHP was selected 16th overall in the 2011 First-Year Player Draft by the Los Angeles Dodgers. Reed is the Dodgers number 5 ranked prospect according to MLB. Former Quakertown Blazer and ACBL All-Star Lou Trivino, pitched a no-hit shutout on Saturday afternoon to lead Slippery Rock past Bloomsburg in a 10-0 win. The 6-5 RHP struck out seven and walked two as the Rock improved to 5-0 on the season. The Upper Bucks Christian grad hurled a one-hit shutout last week against Tiffin in his first start of the season. In 14 innings Trivino has allowed only one hit with six walks and fourteen strikeouts. BUFFALO, NY - For his efforts in leading the team to a pair of weekend wins, senior outfielder Jason Kanzler was named the Mid-American Conference's East Division Player of the Week. The honor is Kanzler's first of the 2013 season, and his third career weekly award. Kanzler powered the Buffalo baseball team to a pair of wins over the weekend, batting .357 with a double, three home runs, and six runs batted in. Additionally, Kanzler extended his hitting streak to 20 straight games dating back to the 2012 season. In the weekend opener against Maryland-Eastern Shore, he went 2-5 with a solo home and a single, stealing a pair of bases against the Hawks as well. He added a second solo home run in a tight loss to VMI Saturday evening, but helped fuel the team's rebound win over the Keydets. He hit his third home run in as many games, stroking a three-run shot to left in the fifth inning, then padded the lead with an RBI double in the top of the ninth in a 10-3 win. He will now look to extend his hitting streak and keep the brief winning streak going into next weekend. The Bulls will travel back to the mid-Atlantic for a three-game series against Longwood. First pitch on Friday is scheduled for 3 pm. Over a dozen former ACBL players started spring training with MLB teams this week. Mike Aviles (NY Generals), John Lannan (Long Island Collegians) and Ryan Vogelsong (Quakertown Blazers) are now the veterans since Jamie Moyer (Allentown) has finally retired. Aviles will bring both his infield and outfield glove as he tries to break into the Cleveland lineup. Lannan is shooting for the Phillies' fifth starting slot while Vogelsong pitches in the World Baseball Classic prior to reporting to the Giants camp. Four other former players with MLB experience in 2012 are trying to obtain spots on the 25 man rosters. Drew Sutton (Lehigh Valley Catz) looks for an outfield spot with the Red Sox while Zach Lutz (Kutztown Rockies) hopes for a corner spot with the Mets. Joe Martinez (Jersey Pilots) and Anthony Varvaro (Metro NY Cadets) are in contention for middle relief slots with the Indians and Braves respectively. LHP Darin Gorski (Quakertown, Kutztown) and RHP Eric Smith (Stamford Robins) are on the Mets and Diamondback 40 man rosters respectively. The non-roster invitees include shortstop Nick Ahmed (Westhampton Aviators) who was traded to Arizona by the Braves as part of the Upton deal and Chris Wallace (Lehigh Valley Catz), a catcher for the Astros. Second baseman Anthony Seratelli (NJ Colts) joins the Royals and LHP Sean Nolin (Peekskill Robins) will be with the Blue Jays after posting a 10-0 record with a 2.05 ERA at Dunedin and New Hampshire. Ryan Vogelsong (Quakertown Blazers, 96-97) has been named to Team USA which will participate in the World Baseball Classic beginning March 7, 2013. 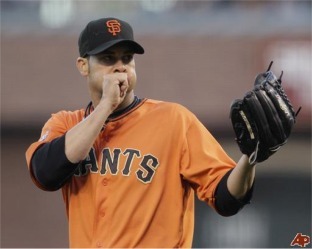 Vogelsong was instrumental in the San Francisco Giants winning the World Seies Championship as he went 3-0 in four postseason starts with a 1.09 ERA in 24.2 innings. During the regular season Vogey posted a 14-9 record with a 3.37 ERA in 189 innings over 31 starts. A 2011 National League All-Star, the 6-4 right-hander netted 27 wins over the past two seasons with a 3.05 ERA and 297 strikeouts for the Giants. Mark Angelo and Aaron Kalb have been named field managers for the Quakertown Blazers and Jersey Pilots respectively. Both players return to their former ACBL teams after outstanding college careers and professional baseball experience. Angelo played three years for the Blazers while Kalb pitched two years for the Pilots and was an assistant coach last year. Angelo, a local product from Quakertown, was an All-Patriot selection at Bucknell and broke season hitting records as a graduate student at East Stroudsburg. He was drafted in 2009 by the Seattle Mariners and played 40 games in the Arizona League as a first baseman and outfielder. He posted a .272 average with a .385 on base percentage. He is currently an assistant coach at Hunterdon Central. Kalb was an outstanding pitcher at Rutgers and played Independent baseball from 2007 through 2011 with stops at St. George, New Haven, Alexandria, El Paso, Newark and the NYSL Federals. He posted a career 4.79 ERA in 192 innings of Indy ball and currently serves as an assistant coach at County College of Morris.